Kinesiology tape just got kicked up a notch. The wildly popular therapeutic tape, known for its ability to rapidly relieve pain and inflammation, has gone high tech. New StrengthTape is a top quality kinesiology tape in its own right, but that’s just where it begins. StrengthTape is made by LifeStrength, the company behind the silicone power balance bracelets now worn by thousands of satisfied customers. Proprietary technology infuses the tape with microscopic particles of crushed minerals and gemstones. These substances naturally emit charged particles called negative ions or anions, which have been associated with a wide range of physical and emotional benefits. Enhanced Antioxidant Activity – Antioxidants protect cells from free radical damage related to overuse, injuries and inflammation. Exercise, injury and illness all generate free radicals that can damage cells and impair their functioning. Antioxidants neutralize these free radicals, minimizing damage and improving cell health. Increased Permeability of Cell Membranes – Every cell in the body is enclosed by a cell wall, a membrane that controls the movement of substances into and out of the cell. Antioxidants increase the permeability of these membranes, enhancing delivery of oxygen, nutrients and water, critical components in both athletic performance and healing. Also accelerated is the removal of waste products such as lactic acid and toxins. These processes combined can contribute to enhanced athletic performance, prevention of injuries and more rapid healing of injuries. Increased Mitochondrial Energy Production – Mitochondria are the energy factories in our cells. They use nutrients and oxygen to create energy. The more efficient the mitochondria are, the better our cells function. 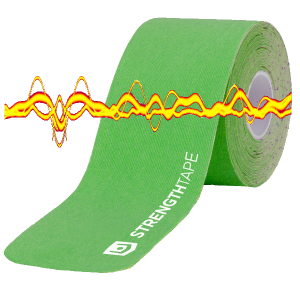 Like all kinesiology tapes, StrengthTape is made from cotton with a latex-free, acrylic adhesive. Lightweight and comfortable to wear, most applications can be worn from 3-7 days, providing around-the-clock benefits.